Urbanism in los angeles is constrained by one thing: transportation. We’ve had and still have lots of utopic dreams here, but they’re always quashed by traffic. Actually, most of those dreams revolve around ‘solving’ that problem, because if we could, then ‘other’ kinds of dreams could play out. LA wants to work better, like the great pedestrian cities of the world, but not so much that it would kill its unique appearance. We don’t want to look like Paris, but an undeground would be great. Actually, we wouldn’t mind looking a little like Tokyo, but not like Blade Runner, with those big pyramids, the fire, and those flying cars. More like the real Tokyo, which has a clockwork like subway and masses of people in small spaces. That’s not part of LA’s near future unfortunately, but there are things to do in the meantime that aim toward a more sustainable future that just may have some sense of another world, but one that LA is ready for. 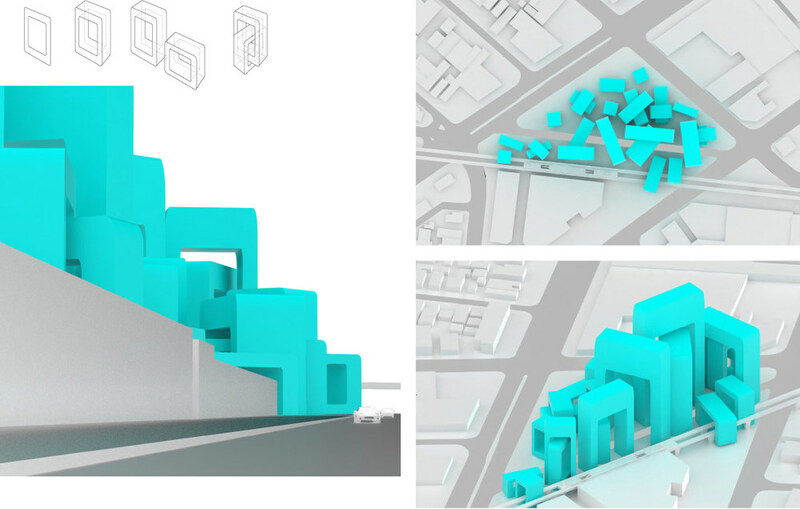 You want to build a project that changes the population density even on a local level? In a way that touches a level of plausibility that makes a proposition compelling? You have to reduce the number of cars and increase the FAR of a site. Simple. (Besides money and politics, but for this excercise, we have all we need of those currencies.) But you need mass transportation to support the paradigm shift, because otherwise you’ll have a nightmare traffic problem and therefore no one will want it or believe it. I always prefer a little reality to go along with my fantasy. Ok, we have a beginning here. LA is building a metro system that looks and works like mass transportation, but it doesn’t serve the masses (right now and really never will). Cars do. It’s not an unwilling populace here, it’s just that the system is not expansive enough to make it possible to live without the car. This is called the “Last Mile Problem” by Toyota, i.e. how to get from a station or main infrastructural hub to your last destination. In LA, it’s more like the “Last Five Miles Problem”. How can we close that gap, not everywhere, but in one small region? Actually, how about just a point? - thus the name and the concern of the studio. Is LA ready? Let’s say that part of the populace is ready. A couple shares one car. People have scooters and bikes. Fitness walking turns into an 800 meter (10 minutes) stroll to work. Zip cars, yes. Plus, there’s uber now. These are little ‘utopic’ steps in the atopic world of North American horizontality. In a way, they are political steps too. Few people are ‘forced’ to change lifestyles, so it’s really a reflection of a post 2008 era when some said, ‘too much!’ Others, like recent college grads, don’t have lifestyles to change - they will inherit the ethos that this is a better way of life anyway. Actually, architecture was blamed in a lot of this, so it’s time to make architecture work in connection with these micro steps towards a better future, to make it effective, but in ways that still challenge the status quo. I always prefer a bit of resistance to go with the reality. Isn’t this utopic enough for now? Located at the Culver City station on the METRO Expo Line, the site currently is parking for rail line commuters. It’s single use (parking lot as emblematic of LA’s more negative image) runs counter to the ‘idea’ of a more urban LA. It is 25,650 square meters of potential and capable of being more than just an oasis of difference when completed. The program is for a small city, a heterogeneous mix of uses that spans across the spectrum: high and lo-rise residential units, entertainment, shopping, work, play, institutional (kindergarten, museum, etc,)vehicle parking. FAR: 4.5 / 115,425 sq mtrs. Number of sq mtrs per program will be determined through massing analysis. 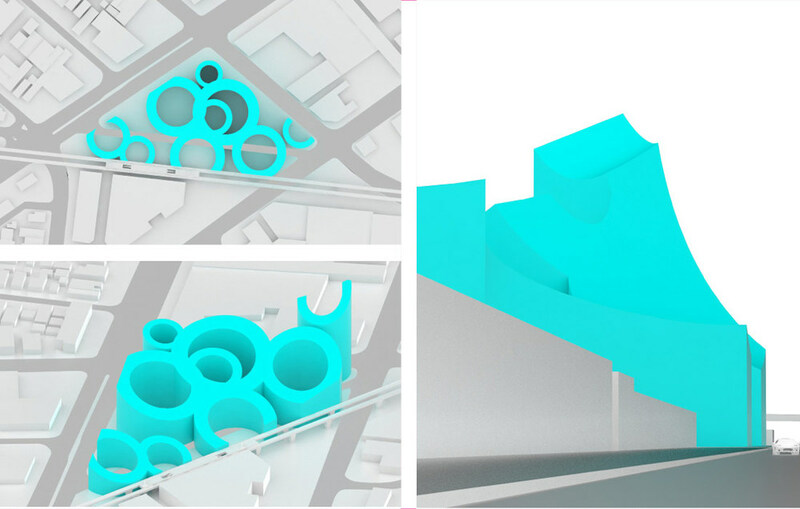 The studio will be taught using a set of prescriptive massing and geometric techniques that revolve around platonic primitives, developable surfaces (conics, cylinders, etc. ), scaling, trimming, and packing systems. The intent is to do more with less, or make what we call ‘high economy’ architecture that reaches a level of order and complexity with the fewest moves. As a way to make the project real (i.e. highly developed) but also suspended in a strange diagrammatic world, one which resists the temtation to prove reality through photorealism, the entire project will be carried out in the CMYK world, the world of color separation. We will make drawings, illustrations, diagrams, and even models within this world of color and all 2D material will be conceived as large scale supergraphic / information design posters. The colors will produce other effects though as they are applied to refined form and serious yet speculative massing arrangements.